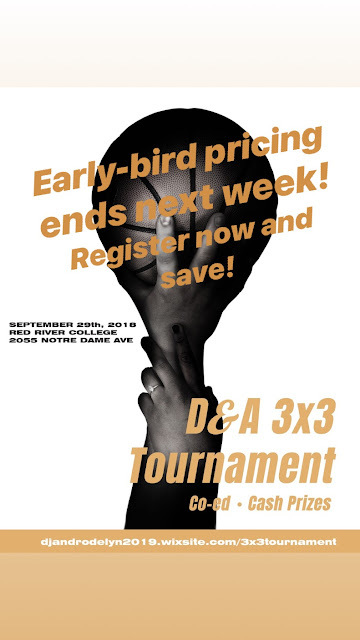 Details on the "D&A 3x3 Basketball Tournament" have been announced and will be hosted at Red River College North Gym on Saturday, September 29th 2018. The 3x3 format tournament will feature 3 divisions with Round Robin and Playoffs. FIBA 3x3 rules mostly applied with some alterations. The tournament is co-ed and open to youth ages 15+ and adults ages 18+anyone. There will be a cash prize for the winning team in all 3 divisions. Early-bird registration ($30 per player) closes July 31st 2018 at 11:59 pm. Regular registration ($35 per player) ends August 31st 2018 at 11:59 pm. The D&A 3x3 Basketball tournament is hosted by DJ Dupasquier and Rodelyn Aaron in support of their wedding social which will take place the same night.